I am attending CES (the Consumer Electronics Show) in Las Vegas, Nevada. 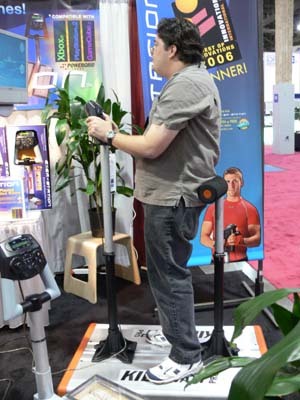 I will be reporting on the health and fitness gadgets I come across during the show. Back then, I wasn’t interested in the huge machine because I imagined it to be colossal. I wasn’t wrong. In my 900 square-foot house, this controller would take up some valuable square footage. The footprint of the machine is at least 4′ X 3′ (or 12 square feet). It’s not like a DDR pad that can be quickly tucked under the couch when the neighbors ring the doorbell. It’s a big thing that would need to be moved out of the way if we wanted to watch a movie on the Xbox. Mike and I enjoyed it, but at that size and cost (prices range from $799 to $1599), it is out of our range. This controller, however, is much more friendly for the home environment. It is called the Exer-Station and it works with Xbox, PlayStation 2 and GameCube. It is a controller that you sit on. 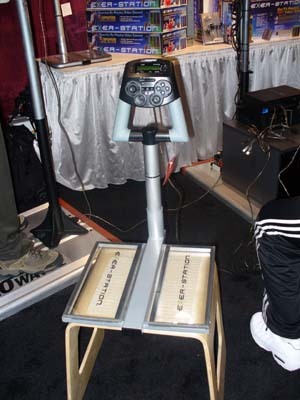 It is shown here resting on a stool. You could just as easily sit on the couch or the floor. 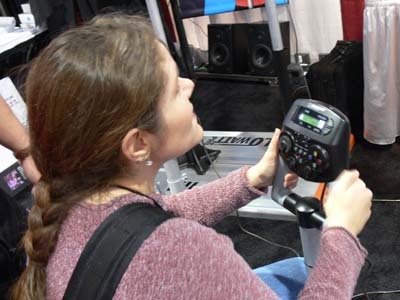 Just like the KiloWatt, it has a variable isometric resistance that works your upper body. 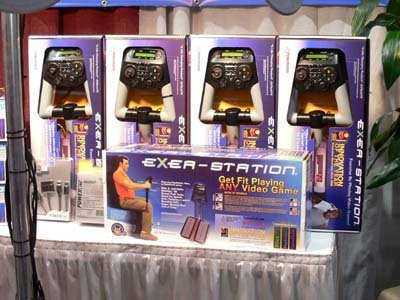 They had these controllers connected to Xbox and PlayStation consoles, showing a wide variety of games that you could play with the Exer-Station. Here is a picture of me playing with it. I actually worked up a sweat playing with this controller. It wasn’t as intense as the KiloWatt, but it did get me sweating in the chilly show hall. I was playing a racing game and it was difficult to keep the car moving. I kept trying to turn the unit to get it to go left and right, but you have to push on it sideways to get it to work. It wasn’t a cardio-vascular workout. I checked my heart rate monitor while I was playing and it was still in the “light” exercise range. It didn’t even get up to the “moderate” range like I usually do when I’m doing weight training. It DID get me sweating, though. Here is a closeup of the actual controller. Because it works with so many different console systems, I found the controls hard to understand when I was sitting in front of people playing. Now that I can look at the picture, however, it’s almost exactly like an Xbox controller. 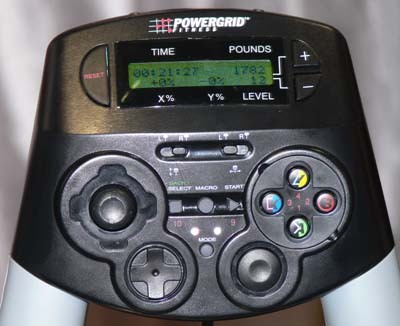 The buttons are labeled for both PlayStation 2 and Xbox controls. The buttons on the top, control the resistance. If it’s too hard, you can lower the resistance. When you get stronger, you can make the workout harder. Maybe if the resistance had been set higher, I might have gotten my heart rate into the moderate range like a normal weight training workout. At only $199, the price for the Exer-Station seems much more reasonable. This is the first product from PowerGrid Fitness that I would be willing to shell out the bucks for. Their website says that Exer-Station will be shipping in February 2006 and can be purchased at Best Buy. Am looking to buy 2 pair of weight lifting gloves with PowerGrid Fitness on them. My son had a pair given to him at a Vegas fitness convention. He loves them. Can you help?